Join Us Next Year in CT! Before the bald eagles migrate to Canada in March, students from several schools in Newark, NJ came to witness the eagle's wintering habitats. Over two dozen bald eagles were spotted during this year's two and one-half hour cruise, which according to one student, was the best field trip she has ever taken. "It is so beautiful here, and the bald eagles are all over the place!" Nearly 200 7th grade students from Gladys Hillman Jones Middle School, University High School, and Ann Street school came to the River this year. Their science curriculum back in the classroom includes 'Signals of Spring.' This is the 4th consecutive year for Newark's students. Signals of Spring wants to facilitate a dozen such excursions. 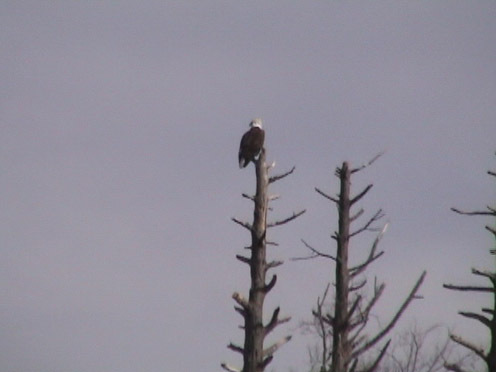 Project Director Glen Schuster says, "As more schools participate in tracking wildlife, there is an opportunity for more students to see first hand so many bald eagles. Connecticut Audubon Ecotravel put on quite a display for our students. The trip motivates students to learn and to describe why animals migrate the way they do, observing how the habitat contributes to students' needs. Back at school the investigations leads to discovery, and more formally, assessments for student achievement in 8th science."